In my Unexpected Performance Piece, I enter museums doing a silent mindful walk, carrying these sculptured drawings, either alone or with other women. In procession, veiled and dressed in black, each carrying one of these "Ribcage Shields," which are handmade paper stretched over wire forms. These paper skins are embedded with drawings and text from my dream journals. Through passages of translucency and opacity the shields present a stimulating interplay between what is visible and what is hidden. 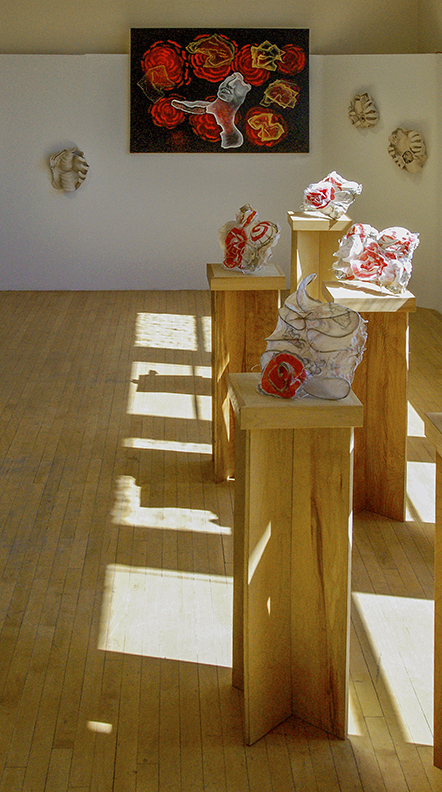 These sculptured drawings include two series of thirteen pieces each, made during a fellowship residency at Women’s Studio Workshop in Rosendale, New York in October 2011 and upon returning in October 2012.